A lot of celebrities on Bigg Boss are infamous for getting into controversial spats even after they leave the Bigg Boss House. Former Bigg Boss contestant Payal Rohatgi is no exception. 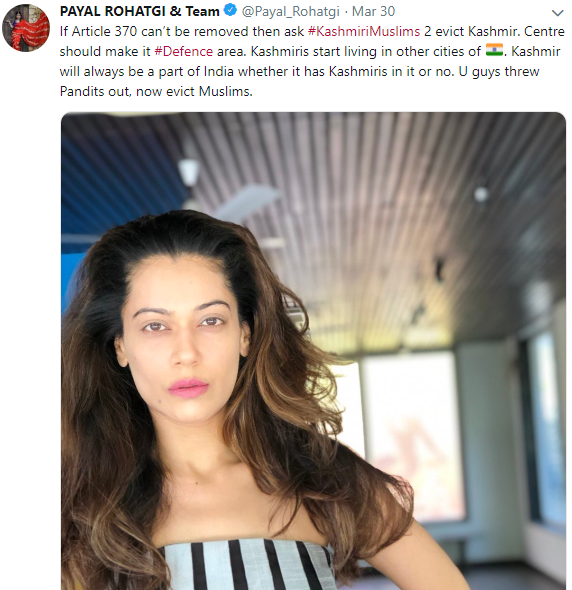 She tweeted about Article 370 (which gives the state of Jammu & Kashmir the status of an autonomous state) and demanded the eviction of Kashmiri Muslims from Kashmir. 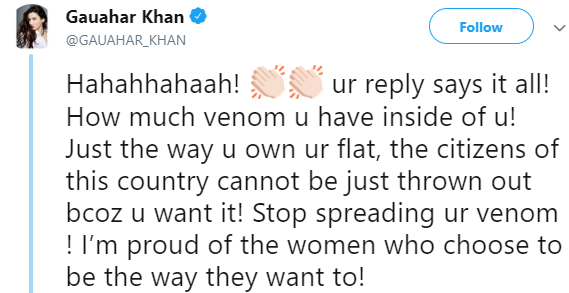 She was called out by Gauahar Khan over the bigotry of her tweets. What ensued post the hateful exchange was more than just a war of words! 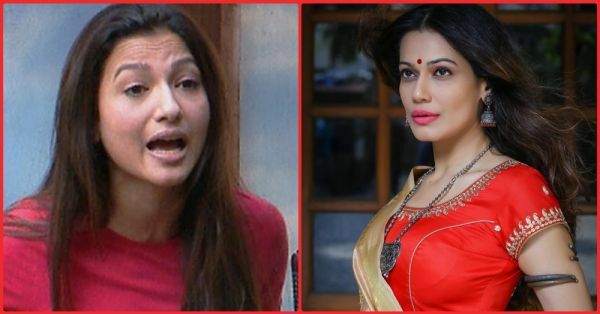 Payal Rohatgi has been a controversy magnet ever since she got evicted from the second season of Bigg Boss. The 36 China Town actress grabbed eyeballs during the show when she got intimate with Rahul Mahajan in the pool. Last year, she was in news because she was rumoured to tie the knot with wrestler Sangram Singh. Gauahar Khan participated in the seventh season, and while on the show, she started dating Beyhadh actor Kushal Tandon. They made a cute couple, but broke up soon after the show ended. During their nasty exchange on Twitter, Payal even accused Gauahar of converting Kushal's religious beliefs. 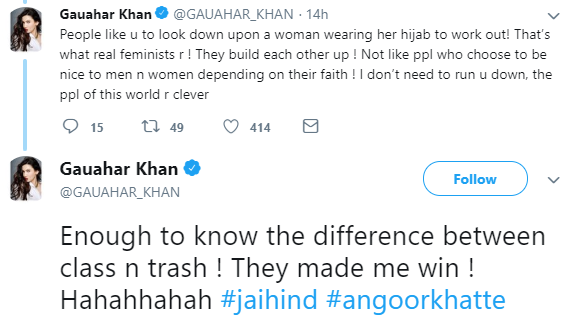 She even went so far as to call Gauahar 'trash' and 'jihadi'. 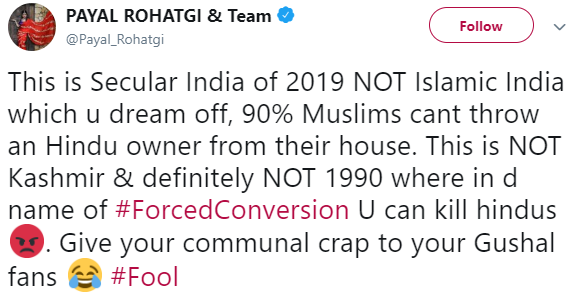 This whole feud started when Payal tweeted against the implementation of Article 370. 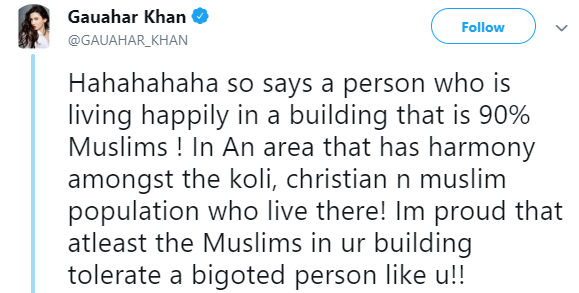 Gauahar Khan, who is known for not mincing words, called Payal a 'bigoted person' and pointed out that Payal herself lives in a building that has over 90% of Muslim population. The retaliation was anything but mellow. 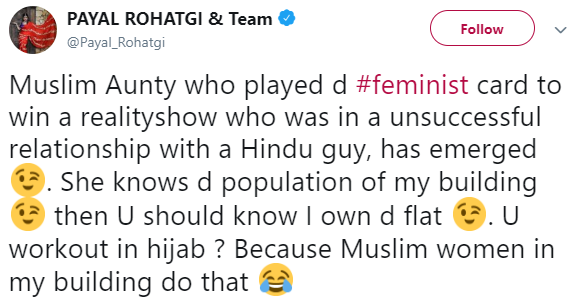 Payal called Gauahar a 'Muslim aunty' who played the feminist card to win Bigg Boss. And she didn't stop there. Payal took a mean jibe at Gauahar and asked her if she works out in her hijab. 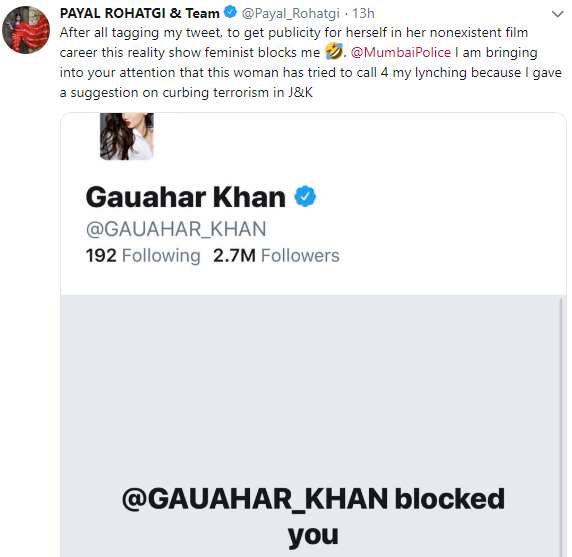 Payal further went on to undermine Gauahar. Gauahar gave it back to Payal, stating that the actress had so much venom inside her. 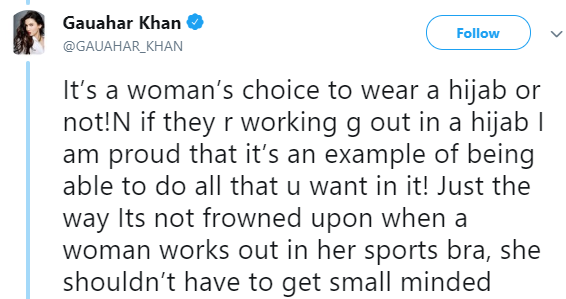 She went on to say that it was a woman's choice to choose what to wear while working out. It could be a sports bra or even a hijab. In another tweet, Gauahar lashed out on Payal and explained to her what a real feminist was. Before blocking Payal on Twitter, she concluded writing, "Enough to know the difference between class n trash!" Payal naturally didn't take this sportingly and rendered Gauahar's tweets against her as a publicity stunt. 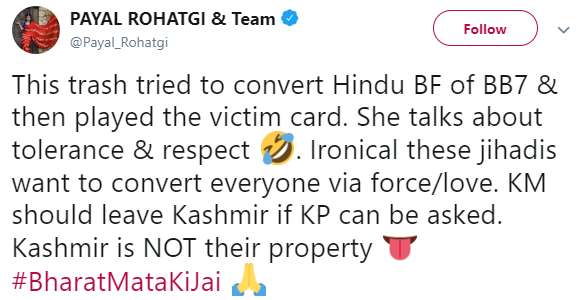 Payal Rohatgi even tagged PM Narendra Modi in her tweets that were apparently suggestions on how to curb terrorism in J&K. However, this is not the first time that Payal has voiced her disdain against Muslims. She, along with her boyfriend Sangram Singh, has been frequently slammed for their communal rants on social media. Last year, when she was denied to board a plane because of her late arrival, Payal insinuated that Muslim officials at the boarding gate made her miss her flight. Her Islamophobia has led her to be at the receiving end of a barrage of angry comments several times on Twitter. Not cool, Payal!